Ukraine and India have signed new contracts worth $20 million to expand bilateral military and technical cooperation as part of the 10th international defense exhibition Def Expo 2018, which is taking place in Chennai (India) on April 11-14, the press service of the Ukroboronprom State Concern reported on Thursday. 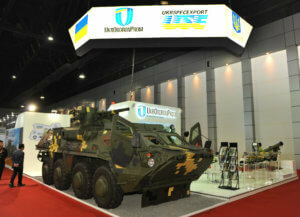 According to the report, following its participation in the first two days of the exhibition, Spetstechnoexport, part of Ukroboronprom, signed contracts worth about UAH 500 million. “Representatives of the state-owned enterprise Spetstechnoexport, as part of Def Expo 2018, signed an agreement on cooperation with Indian state-owned company Bharat Electronics Limited. The agreement outlines cooperation between the parties as part of programs for the modernization and localization of the production of components for armored vehicles. Representatives of the Ukrainian and Indian defense industries are to be involved in the creation of a new a tank for the needs of the Indian Defense Ministry, the modernization of radar and air defense systems produced by the former Soviet Union, and joint research and engineering development, including in the sonar and radar directions,” reads the statement. Bharat Electronics Limited is one of the largest Indian suppliers of defense products for the Indian Defense Ministry. Spetstechnoexport is one of the leading special exporters of Ukraine. It has been part of the Ukroboronprom State Concern since December 2010.